Comet Garradd continues to be a nice object in binoculars or a small telescope, an 8th magnitude comet slowly crossing Hercules. The First Quarter Moon rises around 3 p.m., and sets around 11 p.m. This is the Full Moon after Harvest Moon, so is usually called the Hunter’s Moon. Other names are Travel Moon, Dying Grass Moon, and Blood Moon. In Hindi it is known as Kojagiri or Sharad Purnima, or lakshmi puja. Its Sinhala (Buddhist) name is Vap Poya. The Full Moon rises around sunset and sets around sunrise, the only night in the month when the Moon is in the sky all night long. The rest of the month, the Moon spends at least some time in the daytime sky. This is the smallest Full Moon of 2011. Comet Garradd continues to be a nice object in binoculars or a small telescope, an 8th magnitude comet slowly crossing Hercules. Unfortunately, Comet Elenin, which was hoped to put on a good show this month, does not seem to have survived its close encounter with the Sun. The planet Mars is imbedded amongst the stars of the Beehive Cluster in Cancer. 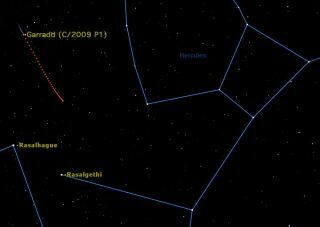 The annual Draconid meteor shower peaks each October and is typically a lackluster affair. This year, the meteor shower is expected to be quite strong, but the timing (during daylight hours for North America skywatchers) and its peak near the almost-full moon suggest it may not offer much of a light show. The Zodiacal Light, the faint glow of sunlight reflecting off the cloud of interplanetary dust, is visible before morning twilight. Mercury, Venus, and the slender crescent Moon set just after the Sun in October 2011. Mercury, Venus, and the slender crescent Moon set just after the Sun. Jupiter reaches opposition in the constellation Aries, and is visible all night long. Mercury is too close to the Sun for most of the month for observers in the northern hemisphere. Venus is low in the evening sky just after sunset all month. Mars begins the month right in the middle of the Beehive Cluster in Cancer. By the end of the month it has moved into Leo and has grown to 5.9 arc seconds in diameter and magnitude 1.1. Jupiter is opposition in Aries in October 28, and is the brightest object in the night sky other than the Moon. Saturn is in conjunction with the Sun on October 13, and is not visible this month. Uranus is visible most of the night in Pisces. Neptune is well placed in Aquarius all month.